[وَمَن يُسۡلِمۡ وَجۡهَهُ ۥۤ إِلَى ٱللَّهِ – And whosoever submits his face (himself) to Allah]; Meaning: This is the one who [willingly and sincerely] humbles and submits himself to Allaah [The Most High], sincerely carries out acts of worship and keeps away from what Allaah has forbidden. 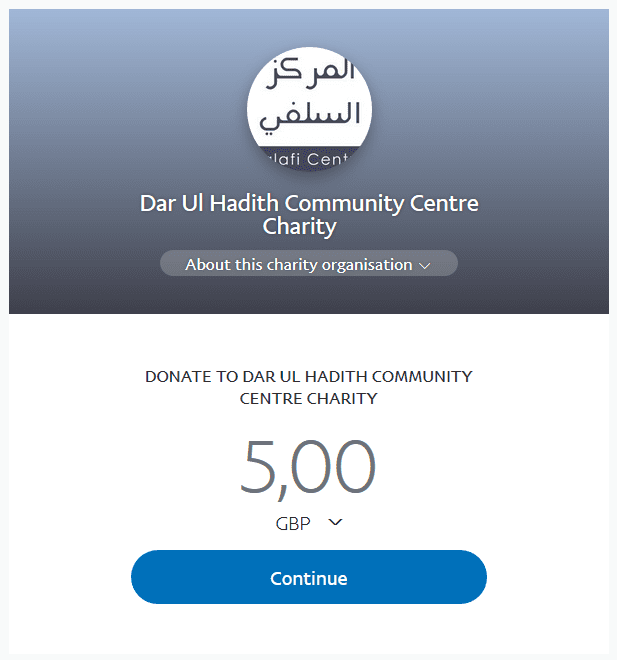 [وَهُوَ مُحۡسِنٌ۬ – while he is a good-doer]: Meaning: A good doer in the religion of Islaam, who [sincerely] carries out acts of worship that have been legislated by Allaah [The Most High] and in accordance with the authentic Sunnah of the Messenger [sallal-laahu-alayhi-wasallam]; or that person who [willingly and sincerely] submits to Allaah by carrying out legislated acts of worship in a manner as if he or she is sees Allaah, even though [that is not possible in this worldly life], but knows that Allaah sees him or her; or that one who [willingly and sincerely] submits to Allaah by fulfilling the rights of Allaah [i.e. worships Allaah alone, fulfil Allaah’s commands and keeps away from what Allaah has forbidden] and fulfils the rights of the people. All the above explanations mean the same thing, because the performers of these [righteous deeds] accept such deeds and perform them perfectly. However, the only difference between them is the [level of striving and sincerity of each person]. Therefore, whoever does this, [i.e. willingly submits] to Allaah, whilst being a good doer in Islam], then such a person has truly submitted to Allaah [The Most High] and is one who has ‘Grasped the most trustworthy hand-hold [i.e. that none has the right to be worshipped except Allaah]’, which will makes a person steadfast and leads to safety – safeguards a person from destruction and lead leads to success through every path of good. 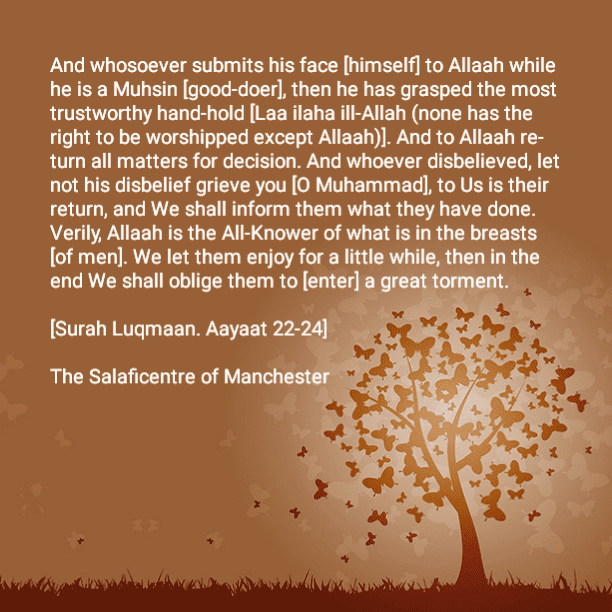 On the other hand, whoever does not submit to Allaah willingly and is not a good doer based on the acts of worship legislated by Allaah and are to be performed in accordance with the authentic Sunnah of the Messenger [sallal-laahu-alayhi-wasallam], then indeed such a person has not grasped the most trustworthy hand-hold. And when it is case that such a person is not among those holding to this most trustworthy hand-hold, then indeed his or her end cannot be anything else but destruction. [وَإِلَى ٱللَّهِ عَـٰقِبَةُ ٱلۡأُمُورِ – And to Allah return all matters for decision]: Meaning: All matters will return to Allaah, so that He will judge between mankind and jinn, recompense them for their deeds and assign them their destinations [i.e. hell or paradise]. Then Allaah [The Most High] said: [ وَمَن كَفَرَ فَلَا يَحۡزُنكَ كُفۡرُهُ ۥۤ‌ۚ إِلَيۡنَا مَرۡجِعُهُمۡ فَنُنَبِّئُهُم بِمَا عَمِلُوٓاْ‌ۚ إِنَّ ٱللَّهَ عَلِيمُۢ بِذَاتِ ٱلصُّدُورِ-And whoever disbelieved, let not his disbelief grieve you (O Muhammad), to Us is their return, and We shall inform them what they have done. Verily, Allah is the All-Knower of what is in the breasts (of men). [نُمَتِّعُهُمۡ قَلِيلاً۬ ثُمَّ نَضۡطَرُّهُمۡ إِلَىٰ عَذَابٍ غَلِيظٍ۬ – We let them enjoy for a little while, then in the end We shall oblige them to (enter) a great torment].